The iPad’s battery suffers from the same weakness that the iPhone’s does – it is non-replaceable. One big difference though is how Apple will handle things when the battery dies (of natural causes) on the iPad – Apple will replace the iPad itself. That’s the final line in a post today at Cultured Code’s Things Blog, covering various arrivals at the company. Things is one of my most-used and most favorite apps on both the Mac desktop and the iPhone. A true essential for me – so I am very happy to see that an iPad version is coming in the not-too-distant future. It sounds like we should be hearing more details on this quite soon as well, since April 3rd is now less than three weeks away. I’d love to see Things for iPad make it into the App Store on Day 1. 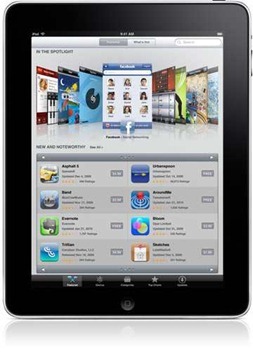 The App Store will feature new apps designed specifically for iPad. 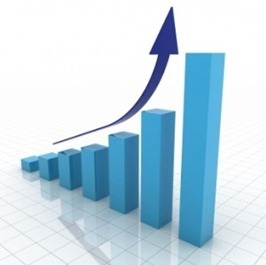 You’ll find hundreds that make the most of its large display, responsive performance, and Multi-Touch interface. iPad apps appear in a special section of the store, so you can find and download them easily. That’s a slice from the latest Apple page for the App Store within the iPad section. No great surprise – but good to see this confirmed. It’s also good to see a reference to ‘hundreds’ – as hopefully this means there will be quite a good number of apps custom made for the iPad right on release day. The Year is 2000, it’s the closest presidential race in the history of the United States… the US Consitution hangs by a chad. Fast forward to the 2012 US elections, no chad/no debate. iPad delivers secure accurate voting in real-time. Vote for iPad and keep democracy safe for a new generation. Countdown to iPad Series – There are countless articles and posts citing what the iPad isn’t or won’t be good at. We think they are wrong. Join us as we celebrate the countdown to iPad’s debut by posting a daily iPad use case. Think of the possibilities! We have many iPad use case scenarios queued up, but could always use more. Please comment and share your iPad ideas below. As pre-orders for the iPad went live yesterday, Apple also revealed a lot more information about the ‘magical, revolutionary’ device, from more tech specs to more details about the not quite built-in (but available free in the App Store) iBooks app. 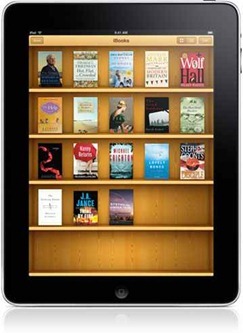 The iBooks app uses the ePub format — the most popular open book format in the world. That makes it easy for publishers to create iBooks versions of your favorite reads. And you can add free ePub titles to iTunes and sync them to the iBooks app on your iPad. 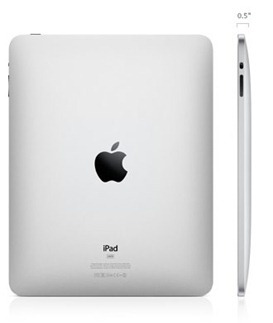 Crazy iPad Numbers: Over 90,000 Sold in First 6 Hours? Wow. It seems the iPad may have some consumer appeal after all – despite those surveys saying nobody except Norwegians was interested in buying it. iPad: time management well in hand. The iPad has an external button for screen rotation lock – just above the Volume up/down controls. This is one of quite a few interesting new things we learned yesterday about the iPad, as Apple revealed more about the device when pre-orders went live. It’s a very handy addition that should make for much more comfortable reading and help gamers out a fair bit as well. Were any of you hoping for any other new buttons on the iPad? 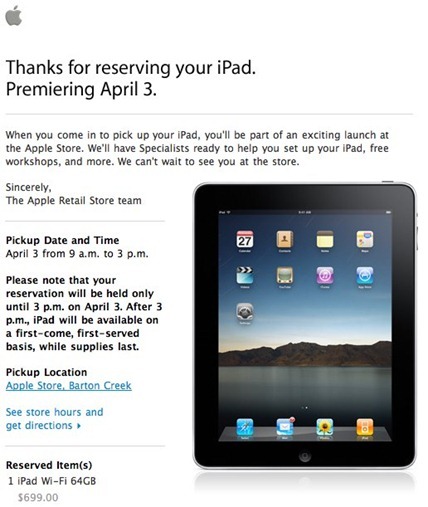 I’ve got my iPad reserved, to pickup at my closest Apple store (about 5 miles away) on the April 3rd launch day. I’ve been told by an Apple phone sales rep that this can only be done online, not in the physical stores themselves – and that’s how I got it done this morning, via the link mentioned in my earlier post. 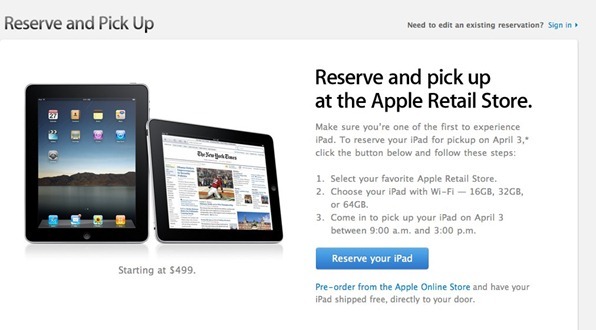 There’s a lot of confusion this morning about whether reserving an iPad at a local store this way means you are * guaranteed * to get one on April 3rd or not. I’ve seen people on Twitter and forums saying they’ve been told it is not guaranteed. It’s a link off the Notify Me page for the iPad. Right now, unfortunately, it is not fully working – at least for Texas. It lets me choose the state of Texas, but then will not fill in anything in the drop-down where you should be able to select your desired store location. If I click the link to go to the store locator page, that works fine and shows me my nearest local store, but will not let me do anything / proceed with it. I’ve reported this to Apple via their sales line, but so far they are just advising that their servers are slammed and to try again in a couple hours. I also asked whether you can do this reserving in the physical store nearest you and was told no you cannot, this can be done online only. Let us know in the comments if you get different results. UPDATE: This is working fine, just not in my Chrome browser. I switched over to Safari and got my reservation done.